Like Nigel Mansell, Alexander Wurz was something of a sleeper in the lower formulae and went largely unrated until he suddenly appeared midway through 1997 driving a Benetton alongside Jean Alesi. Gerhard Berger was ill, and Flavio Briatore needed a replacement. Wurz seemed to fit the bill perfectly. Wurz got his interest in motorsport from his father Franz, who had been a contemporary of John Button on the rallycross scene in the Seventies. But even before he cut the mustard in karting, Alexander tasted championship-level success as a BMX cycle champion. The sense of balance that took him to the top of that world stood him in good stead in motorsport, and he showed strongly when he graduated to German F3 in 1994 by finishing as runner-up to the highly rated Jorg Muller while beating two other chargers, Ralf Schumacher and Norberto Fontana. By 1996, after a slightly less impressive F3 season, he was driving Reinhold Joest's ITC Opel Calibra. In turn that led to a run in Joest's Porsche WSC95 at Le Mans. Partnered with Davy Jones and Manuel Reuter, he won the race in fairy tale style, to become its youngest-ever victor. Subsequently he enjoyed outings in the FIA GT championship for Mercedes-Benz. Wurz has good sponsorship support from A1, Austria's telecommunications giant, and that led to Benetton in F1 after some inconclusive F3000 outings for Helmut Marko. The team was going through a difficult patch, with Berger's illness and Alesi seemingly demotivated. When Wurz bounced in in Canada, it was a wake-up call for the Frenchman. The latter finished second at the British GP, but Wurz was following in his wheeltracks. It was enough to win him a full-time drive for the team in 1998. That year his best finishes were fourths in Brazil, Argentina, Spain, Canada and Britain, and fifth in France, but perhaps his most impressive showing came at Monaco where he resolutely refused to be bullied out of the lead by Michael Schumacher. Unfortunately, a collision between them, caused when Schumacher cut back across him as he defended his advantage, may have resulted in the suspension failure that soon afterwards pitched Wurz off the road on the frighteningly fast exit to the tunnel. Then there was the equally alarming airborne roll into the gravel bed in the first corner of the Canadian GP. Some believe that he never looked as good again. The 1999 season was a difficult one, both for Benetton and for Wurz in particular, yielding but a fifth place in his home race, and sixth at Monaco. 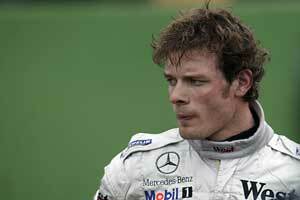 He stayed with the team in 2000 but the signing of Jenson Button meant left him without a job. In October he signed to be the McLaren test driver and stayed with the team until the end of 2005, racing to third place in a one-off race at Imola that year after Juan Pablo Montoya damaged his shoulder. At the end of the year he switched to Williams to be the team's test driver for 2006 and impressed the team to such an extent that he was signed to race alongside Nico Rosberg in 2007, after six long years as a test driver.